I embrace the idea people have different tastes and I strive to accommodate your distinct style. 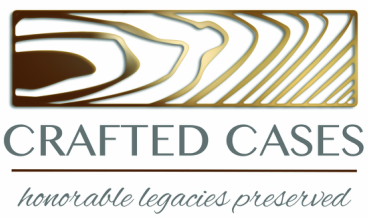 I offer many custom choices to provide you with the legacy gift desired. Do you have a custom case in mind but don't see it in the store? Then please fill out the contact form or call. I will work hard to design a custom case just for you. Type wood: Cherry, Oak and Walnut are my three standard wood types. Cherry has a tight grain and normally has a reddish tint on the unfinished wood. Oak grain is spaced wider and is much denser than cherry or walnut. Walnut does not have a pronounced grain and the unfinished wood is rather dark in texture. Stain Color: I offer five distinct stain choices to finish your special case. Each wood type absorbs the stain differently and projects a different color. I believe you will get close to the finish you desire with one of the listed stains. See the picture below and note how the woods make the same stain color look different! Also note the different wood grains. Memorabilia Case Backing Material: I purchased crushed velvet as the backing material for the memorabilia cases. If you are a veteran, you will see choices that mirror military service colors. The backing material highlights the hard earned medals, certificates, and pictures of your distinguished career. The crushed velvet provides the cases with a rich, polished look. Even if you did not serve in the military, the crushed velvet offers a distinct, rich, elegant background for your favorite memories. See the picture below for color choices. When you place an order, add a comment specifying your color choice in the "note to seller" section as you checkout.